It's been a great week with 7 straight days of flying. The organization was good with retrieves coordinated by L.E. and executed with precision by some of the best volunteer van drivers I've ever seen. The task committee was spot-on in extracting the best flying available by designing tasks each day, and Chris Galli was very helpful in understanding the Salt Lake Basin weather. Mark Gaskill was a good meet director for the week and kept it fun. If I've left anyone out it's because I just returned from a 16 hour drive home. . . I was unable to get quality podium shots so if you have any please send them to timoATbiggovtsucks.com and I will put them up here. Thanks. Congratulations go out to Open Class winner Mads Syndergaard, who dominated the comp and placed first overall. Matt Beechinor, Brad Gunnuscio, Josh Cohn, and Jack Brown filled in the Top-five places overall. The Women's Top-5 were Cherie Silvera followed by Melanie Pfister, Nicole McLearn, Meredyth Malocsay, and Natalia Bonilla. The Serial Class was won by Johnnie Van Duser, followed by Dave Hanning, Steve Young, Darius Lukosevicius, and Cherie Silvera. The Sport Class was won by Jochen Rink, followed by Tim O'Neill, Nicole McLearn, Arun Moorthy, and Gary Scillian. The Masters Class was won by Jack Brown, followed by Mike Steed, Tim O'Neill, Steve Young, and Andy Palmer. The blended scores for the two legs of the US Nationals determined Brad Gunnuscio as the 2009 US National Champ. Congrats to Brad. WHEW! What a week. Seven straight days of flying. The task committee did an amazing job of working with the weather, winds, and FAA Temporary Flight Restrictions to make the week safe, challenging and enjoyable. In seven tasks the total mileage was 547KM and there was someone in goal every day. It's late and I'm pooped. 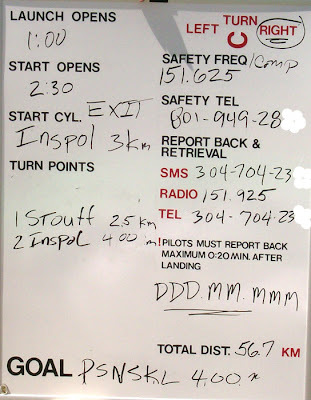 so here's the rundown on today: The task was late do to some conversations regarding a TFR North of the Point of the mountain. We flew the revised task above. It was very hot on launch today. The 53Km task assumed a light west wind. It was a 2Km Exit start around the "Y" mountain, then North to Mahogany. Then we headed South to Stoufer - a school out in the flats. Then it was a glide to Inspolz. Many had issues down low at various locations, so I opted for the high conservative plan. It worked well all day & I was passing pilots all the way to goal. A high Cirrus layer occeasionally blotted out the sun and having height was gold. The race went as expected, I placed 14th for the day. Overall, I placed 23rd and took 3rd in the Masters Class and Second in the Sports Class. The awards party was held tonight and was a lot of fun with great sides and a roast pig for the main. 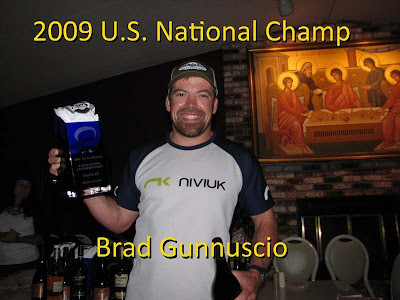 After merging the scores for this comp and the 1st round in Dunlap this year, Brad Gunnuscio is the 2009 - US National champion. I can't even stay awake so get the scores HERE - they will be up ASAP. There were 33 in goal and 20 between the Beacon Hill turnpoint and goal. 55 pilots flew more than 70Km today. As you might have read on the RESULTS page, the meet director has requested that cumulative scores not be published until Saturday's award ceremony. 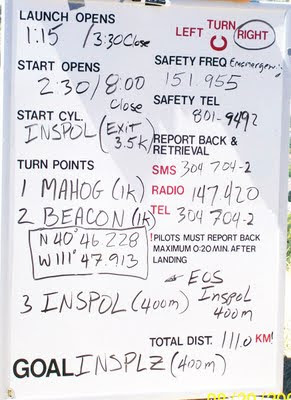 If we fly tomorrow it will be a short task and the awards ceremony will be held at the North side of the Point. Winds were forecast to be light and variable today. The task committee took this info to heart and set a task that would separate the men from the boys. 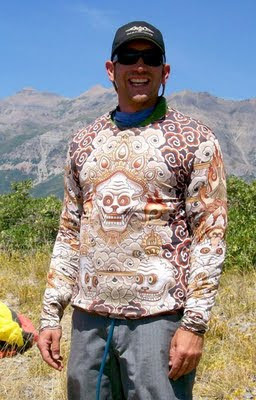 Those who completed the task would hold the new Utah State record and site record. The task called was a 111Km. 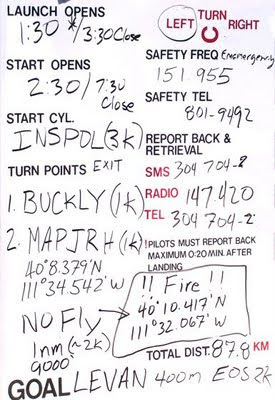 out-and-return flight from Inspo launch to Mahogany Pk. to Beacon Hill (above UOU in SLC) and back to Inspo Launch. The conditions before start were more lethargic than usual. 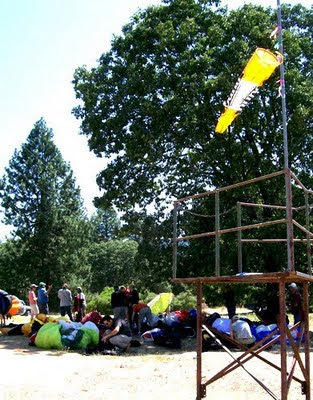 With 30 minutes before the start, only 1/3 of the field was in the air and many were below launch height. 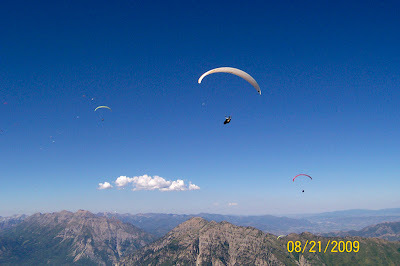 Those that were at the top of the available thermals were only 1000 to 1,500' over launch, bouncing off the inversion. I launched late, about 1 minute before the start, and was able to get just enough height to cross the canyon and work the low hills in front of Mt. Timpanogos. 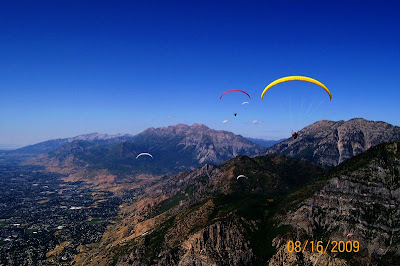 I had hoped to fly along the Timpanogos ridge and take some photos that might give some idea of the beauty of the area, but instead I was bouncing along below 7000' in the hot air with my buddies. As we inched North, the climbs became more substantial and higher. Eventually a rhythm was set and the gaggle continued to leapfrog from climb to climb working loosely together to cover the 30 miles to the turnpoint before the North winds picked up. In the canyon just South of Lone Peak, I made a bad decision and found myself setting up to land at the bottom of the canyon near some outlying homes. At 400' above the ground I aimed for a possible trigger - sure enough, there was some weak lift. I stayed in the area with light lift that averaged slightly more than zero sink for 5 minutes or so, when a hawk appeared to my right and 40' above me. He was circling in lift and out-climbing me so I moved over to him - talking to him and thanking him for his help in finding the core. We worked our way from 7600' to 12,000', all the while he was 40' above me. At the top of climb, he folded his wings and dived to the valley floor as if to say, "From now on you're on your own." This climb made the Lone Peak crossing possible and paved the way to make it to the turnpoint at Beacon Hill. It was at Mt. Olympus that I was passed by the leaders as they began their flight back to the Inspo launch, 45Km away. I was getting tired by now and became fixated on making the turnpoint without really considering my options after making the turn. Bill Belcourt and Chris Galli were 1/2 mile ahead of me and I followed them, passing up a bit of essential lift, to tag the turnpoint. Bill was able to make the low save off a low finger but the rest of us dirted a few km South of the turnpoint after tagging it. 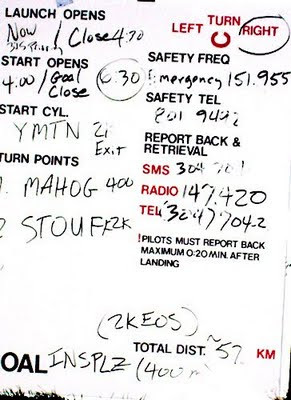 There were three pilots in goal and another 12 pilots within 5km of goal. Considering the day it was a spectacular display of talent and tenacity. My flight track is HERE. I placed 35th today which has further lowered my standing to 28th overall. I'm having fun and learning a lot. Two more days of flying to come. The weather forecast for today was not much different than yesterday's, but it felt very different at launch. It was noticeably warmer with less breeze and cycles seemed very weak. Forecast winds were from the West generally, with the normal Northern flow in the afternoon. Top of lift was forecast to be 10 to 12,000'. The TFR that restricted airspace over the fires to the South had been modified to only one mile in radius, so we tasked to the South again. The task was an 87Km. task from Launch 10K to BUCKLY, then 8K to MAPJRH, then 69K to LEVAN. The launch queue was slow to file off the hill due to less than encouraging climbs by the early flyers, intermittent lulls and occasional back-winds at launch. Eventually we all got into the air for the start. Many were very low for the start but proceeded down range anyway. They were rewarded with nice climbs that put them back in action. 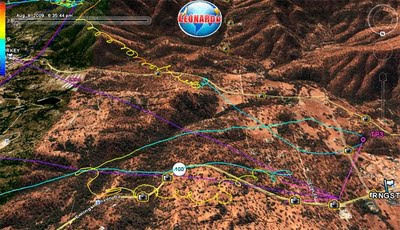 The lead gaggle had specked out and were into the NW winds, using the additional tailwinds to make quick work of the first 2 turnpoints. American Canyon, a wide expanse with large wind generators strategically located in the mouth of a venturi canyon, was the first real crux for most of us. In my case, I found myself groveling at 300-400' AGL, trying to get up while baking in my cold wx gear. I was HOT, LOW, and UPSET, much of today's flight. I guess I gushed a bit too much about yesterday's flight and this was my payback. Those that made it by the wind generators were stuck on a West facing ridge with North winds. It was very hard to get past Payson, and many did not. Those that did get up had a nice downwind leg to goal but it was not an easy flight and many landed along the course line. We had 11 in goal with Mads Syndergaard first and Matt Senior second and Brad Gunnuscio third. In spite of the fact that I placed 35th today, I'm in 26th overall. The temps are forecast to get warmer and climbs to get higher. It may be time to dust off the O2 bottles. I'm looking forward to the next 3 days of flying. 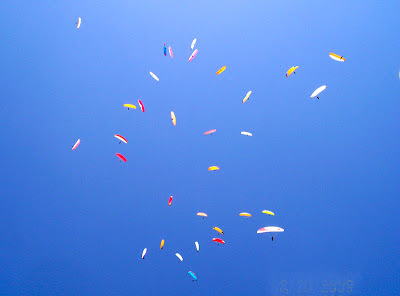 Today was the kind of day that I really enjoy flying paragliders. The task was challenging, the terrain was beautiful, and the air was undeniably spanking us all at regular intervals. A fire South of launch caused a Temporary Flight Restriction (TFR) that precluded our ability to task to the South. This left the only option of flying North along the range. 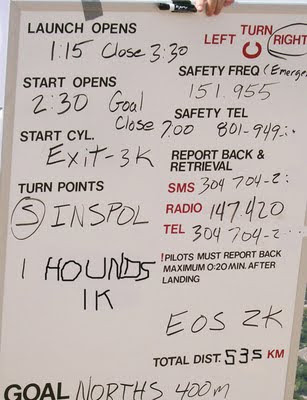 The task committee called a task from Inspo launch 35km to Hounds Tooth Peak, then 18Km South to GOAL at the North Side of Point of the Mountain. The prevailing winds were from the West along our route but the forecast (and all the local pilots) indicated that we should anticipate the wind to steadily freshen from the North in the latter part of the day. Strategically this put us in a mode of flying X-wind along the range with 5 major canyon crossings with the knowledge that we had to get to Hound's tooth Peak before the North winds kicked in. The winds at launch were a bit fickle and slowed the launch slightly, but all got off in good form. I got a great start and vowed to stay high on a day I knew would test my resolve to do so. The first crossing to Mt. 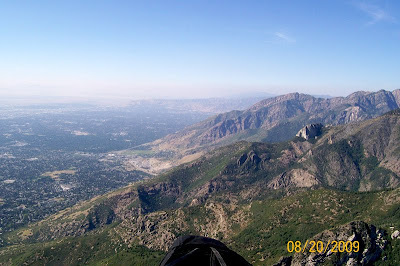 Timpanogos went well but it was obvious from the greeting we got on the ridge that the day would be a workout. The wind was hitting the sheer rockface and thermals were rocketing up the slopes. They were the kind of lift that is so strong and fierce that you don't really even want to turn for fear of getting a serious spanking. As you can see from my flight track there was some strong lift. As we all sidled along the knife-edge of Mt. Timpanogos we could see hikers on the trails gawking at the crazy guys flying sheets around at 11,000'. The way I was whooping and hollering, I can't blame them for thinking we're crazy. I would have had more photos, but I was afraid to take my hands off the brake toggles. The lead gaggle was screaming along by now (the winners had an average of over 32Km/Hr.) and continued on course. It was from that point on, a day of survival. Knowing when to push; we had that headwind to expect soon - and knowing when to slow down to take a climb so we didn't get stuck in a hole; was what made this task a tough one. 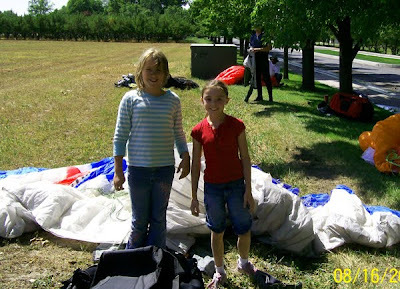 I loved the day - It was #2 in my top ten flights. Second only to my flight in the Owens last year, prior to the Nat's there. This flight had it all, wind, gut-wrenching thermals, and tough strategic decisions. When the group I flew with(+/-2:00)hit the last turnpoint the wind was just starting to veer to a North wind. This gave us a great ground speed of 70-80Km/hr on full bar. It also gave those behind us fits as they tried to tag the last turnpoint. Many good pilots on good wings were unable to get to the last turnpoint due to the increasing North winds. Winners of the day were Josh Cohn who tied with Matt (Farmer) Beechinor. Their times were 1:32 and their average speed was over 32 Km/Hr. I placed 16th for the day and have improved my ranking to 25th overall. Let's hope that the forecast for more good weather is correct - I'm having a blast. The weather has been cooperating here in Utah and we had a stellar day today. Climbs were 'exuberant' at times with fierce jolts of 1500'/min up, but generally the task was well suited for the day. We had 25 or so in goal - many of whom were very late on the course but were able to fly the route well using convergence and taking advantage of the lessening headwinds. 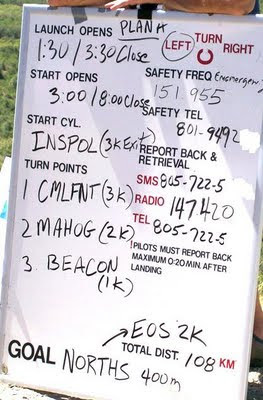 The forecast was for North West winds so a 66K downwind task was called to Nephi airport.. This sounds easy, but it was hardly downwind. In fact, if you took your climbs high enough, you could be looking at a 25K/hr headwind. There were also some expanses across wide mountain canyon mouths that were challenging. The day started late and the task cmty pushed the start time back because none of the (2) wind techs were able to stay up. Finally a few launched and it was on. I was able to get high and back towards Cascade Peak which put me in good position for a nice, high, well positioned start. After the start we headed along the range with one gaggle going back to the higher range and getting 1000-2000' higher than those of us out front. When we got to the end of the range, and we were given the choice of going out over the flats or going left and following the range on the South side of the gap. Many ahead of me were going on (what looked like) death glides into the shadowed flats, while some were hanging in weak lift as they traversed the range. I was high enough to get a very good view of things and had started to turn to the hills on my left when I noticed Jug also heading that way ahead of me. 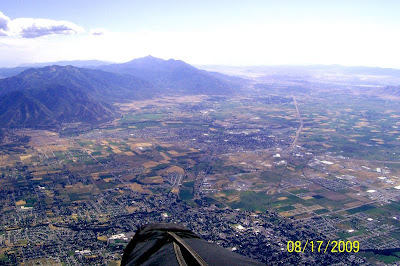 We were able to contact some very nice lift as we flew along the range and worked our way South towards Spanish Fork. Later in the flight another choice of High ground vs. across the flats presented itself. I chose the latter and made it to some very promising bumps that should have been pinging off thermals like mad. I spent the next 20 minutes bouncing along 50-150' off the ridge trying to get up. I ended my flight when a reasonable field presented itself without any others beyond that point that I liked. I was met by Karen soon after landing and we scooped up 7 more pilots before returning to HQ. Meanwhile many pilots who had been behind us were high & going to goal. They flew a better line at a better time, and enjoyed making goal. Mads Syndergaard won with a margin of 20 minutes and has taken 1st overall. I placed 34th for the day which puts me in 40th overall & 3rd in the Sports Class. The next few days look very similar to today, so I hope to get to goal tomorrow and thereafter. 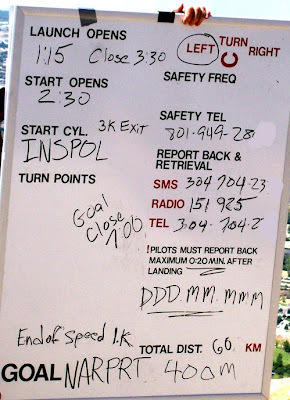 The first task of the US Nats was a 56K task from launch South to STOUFF (12k away) then back to launch, then a 25k leg to PSNSKL. The conditions didn't develop until just before the 2:30 start time so many were struggling prior to the start. I was fortunate to get a couple nice climbs in the 35 minutes I had to survive before the start. I was in a good position for the start, but not as high as I would have liked. Because I am unfamiliar with the local wx and strategy I was very happy to let about 12 gliders pave the way for me as I headed South along the range. I was able to contact a very nice thermal a couple of K's from the first turnpoint, then headed in to make the point. When I returned to the front range for the return to launch I had no idea that the headwind component, coupled with a large area of oppressive sink, would stop us in our tracks. As we approached the canyon which had produced nice lift on the way into the turnpoint, we were greeted with massive sink that required a turn into the wind and resulted in a 2:1 or less glide out to the potential landing options. I hoped for some lift to provide a survival climb but was not rewarded. Many were going into a nice green field at a facility and others were heading for a bigger field with shade at one end and a retrieval van already poised to whisk us back to HQ (not to mention that there were rumors that the vans would have beer - sadly this one didn't). Once on the ground we did the normal commiserating and were greeted by a couple of young, local girls named Caitlin and Kirstin. They asked the normal wuffo questions and were a treat to talk to. MANY were down in the first 40 minutes of the task - I'd estimate that no more than 15-20 made it back to launch. The last leg had a tailwind but had a sketchy stretch over the flats that may make it tough to get to goal. Tomorrow looks like the top-of-climb will be higher. If the winds cooperate we may have a longer task. This weekend Jack Grisanti joined me to fly in a weekend comp at Dunlap, CA. We drove up Friday night and stayed in my Pop-Up camper. 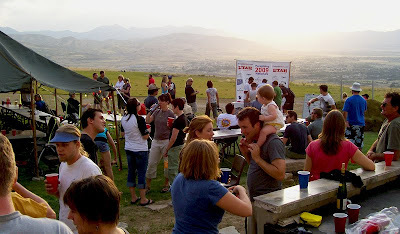 The days were about 85*-90* in the Valley but cooled in the evening for perfect sleeping weather at the top of the hill. The turnout was good with many first-timers and a few visitors from Hawaii, Germany, and Bo from Seoul. The weekend forecast looked like the top of climb would be around 6000' with good climb rates and no cloud. Actual conditions were good with some very small cores that made centering a bit of a struggle. The 65K task on Saturday was lap of the Dunlap valley followed by a 37K leg to goal at Woodlake. I had a good start and was in the hunt for the first few waypoints. At Bald Mtn., the last fix before the leg to Woodlake, I was about 10-15 minutes behind Josh & Eric and Kansas. I was between the lead pack and the second small gaggle. I hit the Squaw Valley turnpoint and decided to go back to Bald for a climb which would also (possibly) allow me to be joined by Steve and Alex to help with the nleg to Woodlake. By now the West winds had established and it seemed to break up the lift on top of Bald. To make a long story short, I ended my flight at the Ranger Station with many others after getting skunked at Bald. I had made what I thought was the high percentage decision. The fact that it didn't work out doesn't it make it wrong, but it does make me replay the decision to look for reasonable alternatives. Eric was the only pilot in goal, with Josh and Alex just short of goal. I placed 5th or 6th for the day. Sunday weather was a carbon copy of Sat. and we called a 39K task that included 5 valley crossings. With the winds, and critical crossings, this task was very technical. Every pilot had at least one or two low saves. I had another good start and was, again, right behind Josh & Eric for the first hour, with Kansas, Alex, and Steve, just ahead of me or hot on my heels. We (the second gaggle) actually traded positions many times as each of us found our own holes, routes, and low saves. 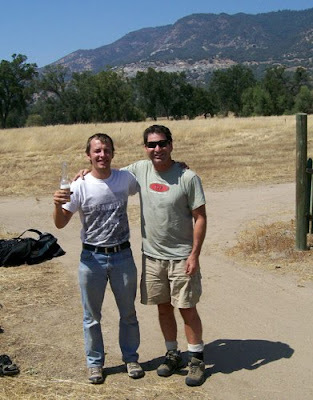 I was very conservative generally, and used most climbs until the net gain (lift vs. drift) was a wash.
Near the end of the task, as I neared the ranger station I passed by Kansas and Josh, who were in the lead and flying from the Ranger station to launch. They were quite low and flying along my track. I had felt little in the way of lift, so I was in doubt about the prospect of lift along that route. As I headed the last 2K to Ranger station, I kept an eye on Josh & Kansas and it was not good, so I made the turnpoint and turned left to a low (200' tall) lift trigger. The hill had been terraced for a home and had a field at the base if no lift was found. Fortunately, I hit a well behaved thermal at about 250' above the ground that took me up 3000' and assured making it to launch. I'd have to say that my decision to take the weak climb, just prior to the ranger station, which gave me the extra 200-300' to get to my lift trigger, was THE decision that allowed me to make it to goal. Luck was a factor too, but in this instance, I made my luck. On the way to launch I found one more boomer that gave me enough altitude to fly from launch to Granny's knob, then to goal. Alex had had a similar save and was only about 5-10 minutes behind me into goal. There were no other pilots at the goal field, so my initial thoughts were that Josh and Eric had gone looking for shade and beer. It wasn't until a guy drove by and congratulated me that I realized I was first into goal 8-) Alex was also surprised when he found out that we were the first. SEE EDIT BELOW. We had a celebratory brew and packed up before a few other pilots landed at the LZ, but I'm unsure if they completed the task. It was a long day that required the dreaded low save. I was able to make goal while others weren't, only because I was lucky enough to get my save when I needed it most. Alex flew very consistently well - placing second on both days. It was a great weekend with a lot of great flights and great people. EDIT - My initial thoughts were correct! Eric Reed won the task day with a great time of 1:20 for the task. I was a full 38 minutes behind Eric. He then continued on to a landing out by the pizza place. Alex and I are happy with second and third. My Sat. Flight is HERE. My Sun. Flight is HERE. This was a fun weekend and a good warmup for the US Nat's next week. 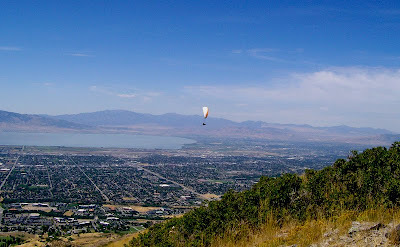 In two weeks I'll be headed for the second and final leg of the U.S. National Paragliding Championships above Provo, Utah. 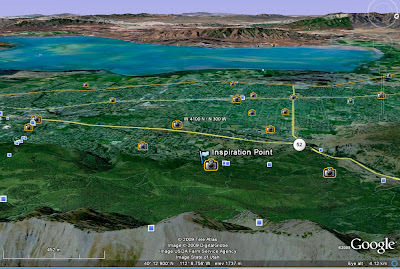 This site provides some spectacular views of Utah Lake to the West of Launch and the high peaks of the Cascade to the East. The panorama above shows the view from launch. 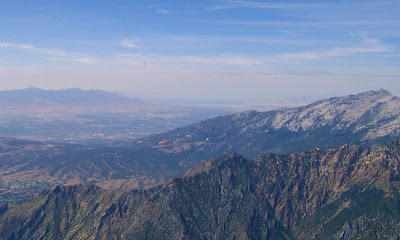 The graphic below shows a Google Earth view from 12,000' above Squaw Peak, with launch in the foreground, looking West. I'll be flying my Avax XC2 in this competition since I still have had little opportunity to fly my Boom 5. I may fly it in the upcoming BAPA weekend in Dunlap, on the 8th-9th.